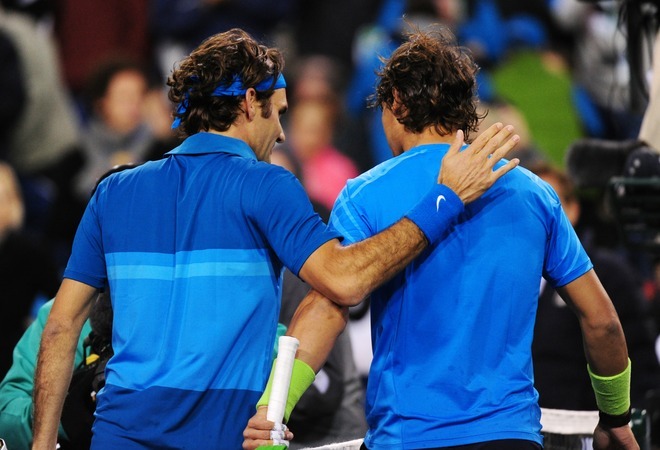 Roger Federer and Rafael Nadal took to the court over three hours after originally slated due to rain delays. Conditions on Saturday at the 2012 BNP Paribas Open in Indian Wells were temperatures nearly thirty degrees cooler than what they were all week. Winds picked up, and the forecast called for rain throughout the day. Federer opened the match serving, and immediately found himself in a 15-40 deficit. What looked to be a heavily favored match-up for Nadal with the cold, windy conditions, turned out differently. Unable to find rhythm even on the slow, high bouncing courts at Indian Wells, it was Rafa who was broken immediately and quickly down 3-0. Familiar to some previous meetings between the two, Nadal broke back and evened the match at 3 all in the first set. Federer then kept course, holding serve for 4-3, and broke again, eventually serving out the set 6-3. The match was stopped by a few brief moments of rain drops. Federer and Nadal both cautious of the court becoming slippery, were told to sit for a bit by chair umpire Steve Ulrich. Federer broke early in the second set and looked to run away with the match as he did against Nadal at the 2011 London World Tour Finals. Missing opportunities to go up two breaks, Nadal kept himself in the match and put pressure on the Swiss maestro to keep ahead. Federer, dedicated to the cause, continuously pummeled forehands into Nadal’s weaker backhand side. With a double break lead in hand, things looked over. However, there was more drama to add to the day, piling on the great victory John Isner pulled off over Novak Djokovic earlier. Federer was broken while serving for the match, and with a hold by Nadal, the second set became competitive. Nadal sensed his chance to turn the match around. After the Spaniard used a bathroom break on a routine changeover, Federer set out to serve out the match. Once again, drops of rain fell on court, forcing the players to sit down for a mini-delay on match point. When play resumed, the Swiss maestro needed only one swing. An ace by Federer sealed his place in the final, with a 6-3 6-4 victory in 1 hour 31 minutes. Federer hit 29 winners and fired 6 aces, winning 64% of his first serve points in the gusty conditions. 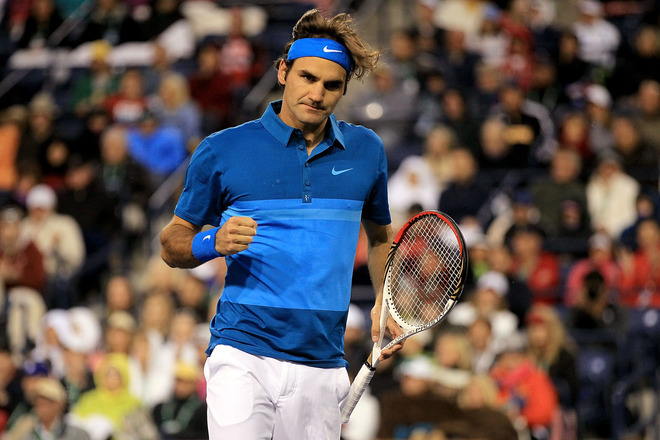 The Swiss maestro is now 17-2 in 2012, and is 38-2 since the 2011 US Open. He will go for his 19th masters 1000 title in Sunday’s final vs John Isner. Federer has won 5 of his last 7 tournaments. Watch Sunday’s final on FF07tv at 2pm EDT/11am PDT (USA), following the women’s final between Victoria Azarenka and Maria Sharapova.